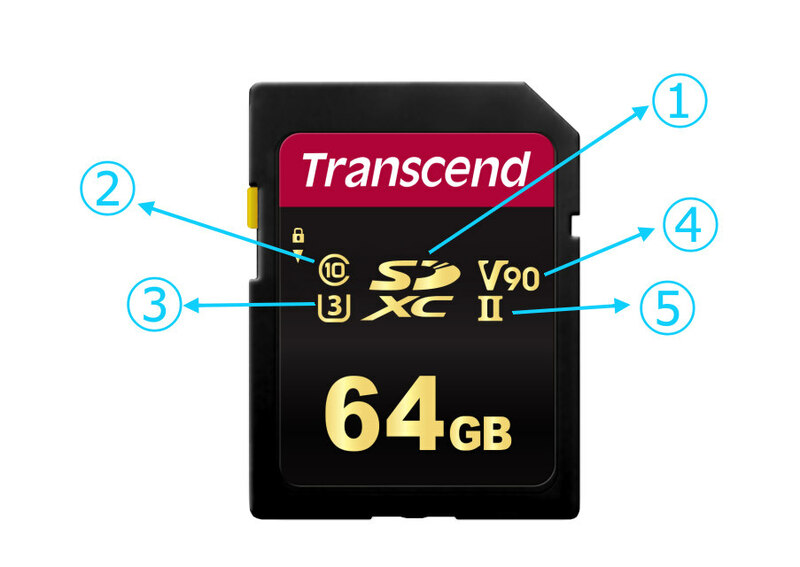 With the latest recording equipment requiring the ability to capture 4K video and continuous shooting images, it means that we may need some new memory cards to access all of the camera?s features. 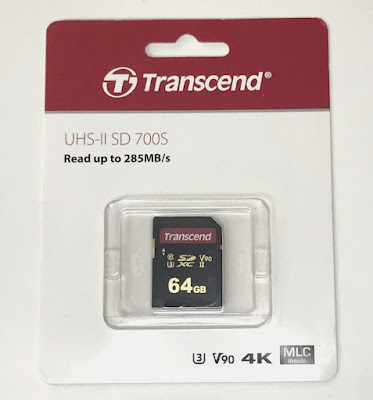 Transcend recently introduced the 700S series of SDXC/SDHC memory cards, which provides the performance and capacity necessary to harness the full power of UHS-II compliant DSLR cameras and camcorders. With capacities of up to 64GB and transfer speeds of up to 285MB/s, these UHS-II memory cards allow content creators to capture and work with high-resolution RAW images and high-quality 4K videos faster than ever. The Transcend UHS-II SD 700S card has a black label with gold lettering. It is made in Taiwan and is backed by a 5 year warranty from Transcend. The easiest way to know about a memory card is to read from the numbers showing on it. 1) SDXC cards were developed to support high storage capacities from 64GB up to 2TB. Additionally, SDXC cards use the exFAT file system to support the large files that can be produced when recording video at high bitrates with cameras. By comparison, files are limited to 4GB in size with the FAT32 file system used by other card types. 2) Class 10 is an older speed-class rating. It is redundant of the UHS speed class, but many card manufacturers include it. A class 10 is the fastest of the old speed class ratings and a class 10 card is verified to never write slower than 10 MB/s, class 4 would be never slower than 4 MB/s. 3) U3 (UHS Speed Class 3) was developed to deliver the necessary write speeds for cameras that shoot 4K and high-bitrate video. U3-certified SD cards will never write slower than 30 MB/s to ensure that recording continues smoothly without any dropped frames. 4) V90 (UHS Video Speed Class 90) -compliant means the card can record up to 90MB of video per second to bring you smooth, interrupted 4K video capture. 5) UHS-II (Ultra High Speed Phase II) takes advantage of the UHS-II bus maximum read speed of 312MB/s. to support advanced DSLR functions such as continuous shutter bursts and rapid shooting, as well as RAW and JPEG captures. 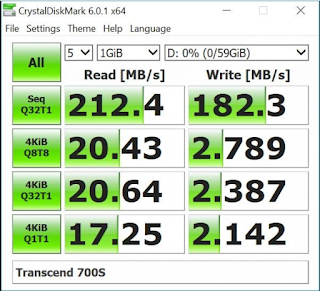 The SD 700S constructed of durable MLC NAND flash, is capable of read speed up to 285MB/s and write speed up to 180MB/s with UHS Speed Class 3 and SD Speed Class 10 performance. In addition to incredible transfer speeds, the 700S series cards are UHS Video Speed Class 90 (V90)-compliant, making them ideal for smooth, interrupted 4K video capture and post-production. 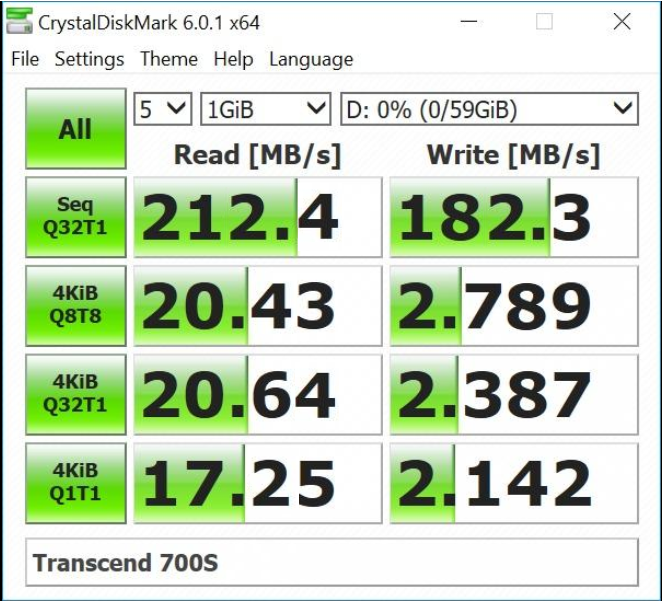 Here is a quick speed benchmark result. The 180 MB/s write speed rating looks accurate. The specifications on Transcend?s web site for both products appear to be identical. The real-world test came with using the Sony RX10. During my testing I?ve shot a whole lot of video at 4k, 24p, and 200MB/second. When I?d stop the recording, the little light that indicates that the information is being written to the card kept telling me that it was pretty much done after a second. That?s impressive: with a number of other cards, I don?t necessarily get the same reliability or speed. When it comes to recording video, this is absolutely fantastic. If you?re a photographer, you?ll pretty much just be limited by the camera?s buffer. At one point, I was shooting RAW+JPEG at the max FPS, and it needed a while to clear up. But it worked out just fine and after about seven seconds or so. If you?re a photographer who occasionally shoots video then consider this Transcend SD 700S. It is high speed and very reliable and that?s all I want.